When I was a strength coach at Columbus Academy back in the day, before they got this nice cushy weight room, we had our weight room in a place we called the barn. Garage door opening, no A/C, everything tucked in nice and neat. Yes, very “old school”. Even though, I am well-versed in SAQ training, I was only asked to monitor the strength side of the workouts. That being said, I was always amused when I watched the football team go through their speed school. One hot summer day after the kids were done lifting, the assistant coach took them onto the football field as they began speed school with some plyos. No one was lifting at the time in the weight room, so I pulled up a chair at the garage door to witness the shin scraping that was about to begin. They had 3 heights of boxes. We will say they were 30”, 36”, and 42”. They formed a line and one at a time, they jumped the first box, then the second, and finally the third then back in line. If I had been thinking, I should have pulled out my phone to record for the funniest home video show. Some kids had no problem with this. They were skilled athletes. They would hop up and down on all three boxes, then get in line to wait their turn for the next round. Of course, it was continuous so the kids rest inbetween sets wasn’t very long. Maybe 30-45 seconds. Probably not enough rest for the athletes to recover and develop the explosiveness the coaches were wanting. Yes, the kids who were a little younger, not quite as developed, and could barely jump high enough to slide a piece of paper under their feet. They were expected to do jump onto the same boxes. There were so many scraped shins, bloody socks, and bruised legs from kids not making the jumps and continuing on. One poor kid was a freshman/sophomore pudgier lineman type build. He hit the first box, slipped on the second, and basically jumped into the third box. It was a rough day for him. I am all for plyometrics. I think there is definitely a method behind the madness, but if done without proper guidance it could lead to joint pains and other issues that would cause the athlete more harm than good. Plyometrics can be done with kids of all ages, you just have to adjust to the level of maturity. Make sure when the kids land, they land soft with flexion in the knees, ankles, and hips. They shouldn’t land flat footed and loud. If the athlete can’t standing broad jump his/her height, then the volume of your plyometrics should be reduced so they can handle the load properly. A beginner athlete should have fewer amount of foot contacts then an advanced athlete per session. For example, a beginner might be able to handle 60-100 foot contacts, an intermediate 100-150 foot contacts, and an advanced 150-200 foot contacts. A foot contact is every time your feet touch the ground and then you jump. If it takes you 10 bounds to cover 30 meters, then that was 10 foot contacts. Use common sense for the level of each plyometric drill. Skipping is far less intense than bounds. Hopping over 10 meters is less intense than setting up 30 inch hurdles over 10 meters and hopping over those. Younger athletes and not as skilled athletes need to use lesser intensity plyos than older more advanced athletes. 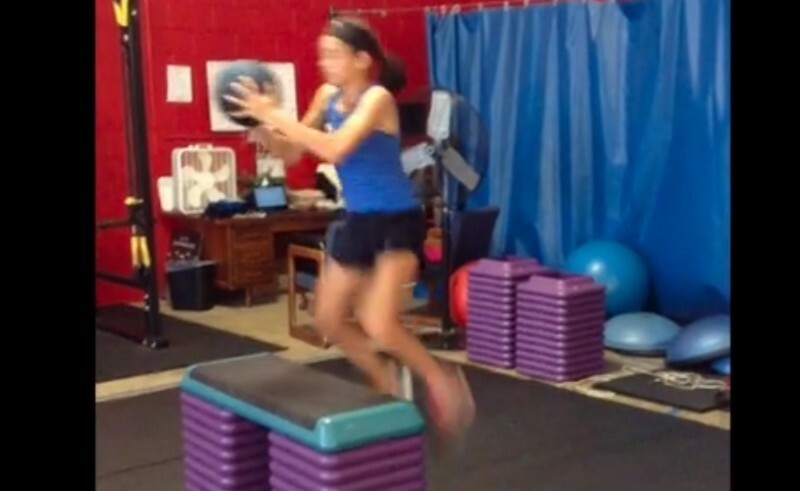 Sometimes this is tough to adjust because the kids want to keep jumping higher and higher, but when doing box jumps try to only jump to a height when the kid lands there is moderate flexion in the hips and knees. You try to avoid where they end up making the jump because they have great hip flexor flexibility and land looking like a frog. If jumping on the box is too tough, do the reverse and have them stand on the box (maybe at a height of their standing vertical jump) and land trying to stick the landing. This will help improve their deceleration and reduce the chance of injuries happening. I could put a million other bits of advice on here for plyos, but I think the biggest thing is work on the athlete’s overall strength and especially in the legs and core. Get that better and then you can work on the fun plyo stuff.